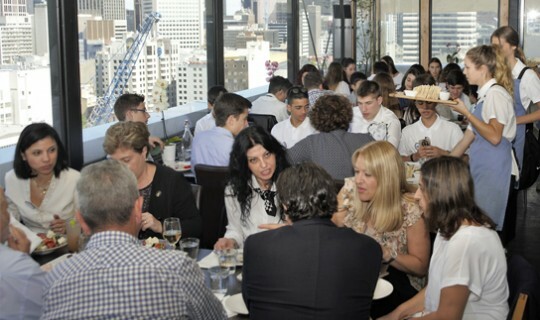 The Greek Community of Melbourne welcomed at the Greek Centre 22 students and three accompanying female staff of the 1st 1st Junior High School in Voula Athens who are visiting Melbourne after an invitation from the Alphington Grammar School. During their visit in Melbourne, they attended classes at Alphington Grammar, visited the Greek Orthodox Archdiocese, had morning tea at Parliament House and a river cruise. They also had a trip to the Great Ocean Road, to the Puffing Billy and visited the Shrine of Remembrance, the Greek Memorial, the Lemnos Memorial, and the Immigration and Hellenic Museums. "I think this is a life trip for children,” said the Principal of the School Ms Maria Kaskantami. “It is very important for us to know that here on the edge of the world there are Greeks who are waiting for us to host and show us their love. "